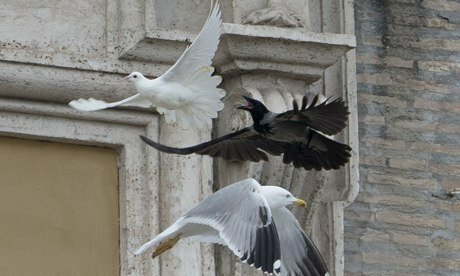 Two white doves released by Pope Francis and two children in Vatican City as a peace gesture have been attacked by a seagull and a crow. The birds swept down on the doves after they were set free from the Apostolic Palace during the Pope’s weekly Angelus prayer. Tens of thousands of people watched as one dove struggled to break free. The crow pecked repeatedly at the other dove. It is not clear what happened to the doves that flew away. Who died in American Horror Story: Coven? Season finale.